Invited guests begin arriving by boat at Soldier Island off the coast of Devon, England. They are a mixed bag with no one knowing the others, and not knowing why he/she has been invited. Their host doesn’t show up, and the guests begin to die – to the sounds of the sinister nursery rhyme “Ten Little Soldiers.” There is only one house on the tiny island, no harbor, and just a small boat dock where groceries and passengers are dropped off. Does this sound creepy enough? Who is doing the killing – one of the guests, the hired help, or perhaps someone hiding on the island? As the corpses mount, there is concern that the audience just might be included among the carnage. 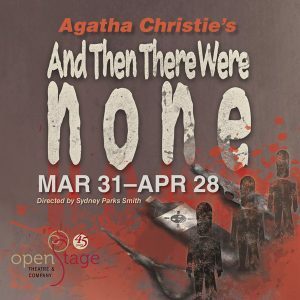 Agatha Christie’s famous whodunit has been around since 1939, turning up as a novel, several movies and plays. It is Christies best seller, with 100 million copies sold. It is the world’s best-selling mystery, and one of the best-selling books of all time. The story has held up well, and the current OpenStage cast is in fine form. Even better than “fine form.” All eleven of the formers are familiar to Northern Colorado audiences. Each has his/her moment to shine in this cleverly crafted sinister scenario. 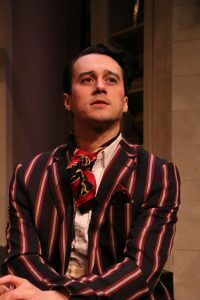 Kiernan Angley, who delighted audiences in “Romeo and Juliet” a few seasons ago, is great fun as an over-the-top young man, Anthony Marston, with an enormous ego. 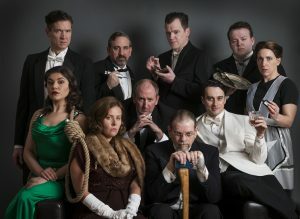 Other favorites includes James Burns as Philip Lombard (the only guest with a gun), Brikai Cordova as Vera Claythorne (secretary to the host she has never met), and Greg Clark as Sir Lawrence Wargrave. As the guests arrive and learn that their host isn’t going to show up that night, a voice recording of the unknown host advises that his presence is there to haunt the guests. Each is reportedly concealing a death they caused earlier in their lives, but for which they were never punished. On the mantel above the fireplace is a reading of the poem “Ten Little Soldiers Boys,” as well as ten soldier figurines that begin to tumble to their deaths as the cast is reduced. Dan Tschirhart is excellent as Dr. Armstrong; Jessica Emerling Crow is wonderfully annoying as the religious fanatic who knits incessantly. Mark Terzani is the mysterious General Mackenzie; David Austin-Grӧen is William Blore who may or may not be who he claims to be. Jack Krause and Debbie Swann are very good as the servants, hired by the mysterious host. They are a husband and wife who have secrets of their own. Andrew Cole is Fred Narracott, the man to bring supplies and passengers by boat to the island, never returning as a storm makes transportation to and from the island too hazardous. The impressive set design is by James Brookman, with properties and set dressing by Carla Brookman. It is very attractive vacation home with modern conveniences, and a fine view overlooking the stormy seas. When the storm causes the electricity to fail, the guests hover in the semi-light of candles, fearful of each other and of what just might be outside the door. The fear of the unknown turns to near comic melodrama a few times, especially at the conclusion of Act 1 and again at the end of Act 2, when more deaths are announced. Total performance length is less than two and one-half hours, including two ten-minute intermissions. Cast needs time to change costumes and three-act plays were the norm when the play was written in the 1930s. The total experience is a well-produced crowd pleaser. Highly honored performer and director Sydney Parks Smith has directed a spooky telling of the Christie tale. Parks is assisted by the work of James and Paula Brookman (set design and set dressing), Grant Putney (lighting), Victoria Villalobos (sound), Kirsten Hovorka (hair design), Maggie Cummings (makeup design). and Maile Hӧrger-Speetjens (costumes). 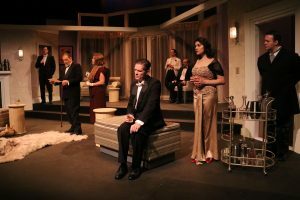 Audiences can find out what happened to the eight guests and two housekeepers on the Magnolia Stage through April 28.